A leak in the Keystone XL (KXL) pipeline occurred just days before Nebraska decides on the fate of a pipeline expansion. The tar sands oil that would be carried by the pipeline are currently being shipped by rail but not at the rate they would be if the $8 billion KXL expansion were built. If the KXL runs at full capacity it could ferry up to 830,000 barrels per day. There are many reasons to oppose the KXL. The tar sands require more energy to transport by pipe and more energy to refine. As revealed by oil spills in 2015 and 2016, oil pipelines leak. Tar sands pipelines are even more likely to leak than those that transport conventional oil and when they do, they are harder to clean up. This puts dozens of critical waterways at risk. Tar sands also emit at least 20 percent more greenhouse gases than conventional oil. That is why tar sands pipelines are often referred to as carbon bombs. We can ill afford a surge in greenhouse gases as we ebb ever closer to the upper threshold temperature limits. TransCanada announced that the leak was detected on Thursday, November 16 at 6 am. The pipeline was shut down after more than 5,000 barrels leaked in Amherst, South Dakota. The 1,200-mile pipeline pipeline stretches from Canada to the Gulf States. The sections affected run from Hardisty, Alberta, to Cushing, Oklahoma, and the towns of Wood River and Patoka in Illinois. The southern part of the pipeline is still operational. 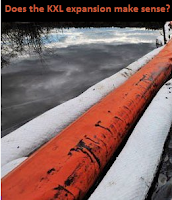 The leak could not be more untimely for pipeline advocates. On Monday, November 20, the Nebraska Public Service Commission is scheduled to announce its decision regarding the expansion of the controversial KXL pipeline expansion. The most recent KXL leak follows another that occurred in April 2016. Leaks are one of the reasons that people protest oil pipelines. Protests against Canada's Energy East succeed in killing the pipeline project. The KXL has been much harder to kill. It has died and been resurrected at least twice. Similarly, the Dakota Access Pipeline (DAPL) has also been stopped and restarted a number of times. Within a week of his inauguration, Trump signed executive orders to push through the KXL and Dakota Access pipelines (DAPL). This is but one example of a raft of measures taken by the Trump administration to kill environment and climate regulations and clear the way for fossil fuel development. Because the KXL crosses the border between Canada and the US it is considered an international project and as such it requires review and approval by the US Department of State. However, in the Trump administration that now amounts to a rubber stamp precluding any environmental review. Many are questioning the economics of the KXL. TransCanada has been having a hard time finding oil producers and refiners who want to invest. Triple Pundit reported that major oil companies including Shell, ExxonMobil, Chevron, and Statoil were pulling back due to low oil prices. However, A subsidiary of Koch Industries is banking on higher oil prices and they are acquiring new tar sands leases. Koch Industries is already among the largest tar sands leaseholders in Canada. This is a similar move to their shale gas play. They bought in as the prices fell and hoped for a rebound. The situation is complicated by the interdependence of these two North American fossil fuel producers. The US needs Canada's tar sands oil to refine the large quantities of ultralight oil that is being produced. More pipelines are being built to ferry even more of this ultralight oil to the coast. This means that as long as the US continues to produce its fossil fuel reserves the KXL will be in demand. Canada must also import US ultralight oil to move its tar sands through pipelines. So the US and Canada are locked in a vicious and dirty circle. These market forces are countered by widespread opposition to the KXL. Environmentalists are not the only ones that are resisting the KXL, there is also a grassroots movement of farmers and ranchers who are opposed because they want to protect their property rights. Trump made the building of the pipeline more difficult when he insisted that it be built with US steel, he then recanted and waved the requirement. Up to a few thousand temporary jobs would be created to build the pipeline, however, only 35 permanent jobs would be generated by the project. Approximately 70 percent of oil is transported by pipelines, 23 percent by river barge, and 4 percent by truck. Only 3 percent is transported by train and it can cost as much as five times more to transport oil by rail than it does through a pipeline. Making oil transportation more expensive decreases its demand and this is good for those who know we need to leave it in the ground. The most important calculation is not about supply and demand it is about the CO2 load associated with oil pipelines. The math on carbon emissions associated with fossil fuels is clear. We cannot exploit the majority of existing oil reserves if we are to stay within prescribed upper temperature limits. As illustrated by this most recent incident, pipelines inevitably leak. However, other means of transporting fossil fuels are no better. Trains derail and barges and trucks crash. The truth is there is no safe way to transport fossil fuels.